Learn how to download movie from here! The true story about an honest New York cop who blew the whistle on rampant corruption in the force only to have his comrades turn against him. The movie tells the true story of Frank 'Paco' Serpico who was about the only honest cop of the entire New York police department at his time. The movie provides a realistic view in the corrupt and tough world of the New York police and tells the story of Serpico in an intriguing and realistic, perhaps maybe even documentary like way. 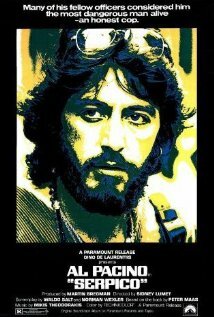 "Serpico" is a movie with a typical fantastic '70's atmosphere and it's a movie that still holds up today. This is mainly thanks to the fantastic story of the movie and the way it is told. Yep, they really don't make movies like this anymore. I think "Serpico" may already be regarded as a 'classic'. Actually the story itself or concept isn't that terribly original compared to many other movies from the same period. Still this movie distinct itself from most of those movies, thanks to the perfect directing from Sidney Lumet. Also Pacino's acting and the fact that his movie is based on a true story makes this movie better than most others. Lumet and Pacino continued working together and later made the even better "Dog Day Afternoon" together. But fair is fair, even though Pacino is fantastic, this is far from his best role. The 'explosion' he later used for his characters in movies is still missing here and it seems like he's holding back. I also think that his Oscar nomination he deserved for this movie was also a bit too much credit for him. Pacino was just a young beginning actor at the time (He had just done his first big role and movie; "The Godfather".) and he obviously had still a lot of learning to do. The rest of the cast consists out of unknown actors (with the exception of apparently Oscar winner F. Murray Abraham in one of his first small movie roles, to be honest I didn't even noticed him.) but for a movie like this a cast with unknown actors work really well. It keeps the focus on the movie's its intriguing story better. Apparently there is a lot of hate for it but I really liked the musical score by Mikis Theodorakis. It was really fitting with the movie its atmosphere. All in all this is a already 'classic' typical '70's cop flick in the style of, for instance "The French Connection" and is an absolute must see.